With the looming June 30 deadline for NRIs to exchange old Rs 500 and Rs 1000 notes, “Note bandhi” is back in the news. This is my own personal experience about how genuine wealth became “kagaz-ka-tukada” in the words of an RBI officer, and lack of clarity on what people should do with that “kagaz-ka-tukada”. I was a staunch supporter of Prime Minister Modi even before he was declared the Prime Ministerial candidate. I continue to support his vision and policy directions. I also supported his demonetization decision. I responded to several blogs, tweets, face book posts and continue to do so. 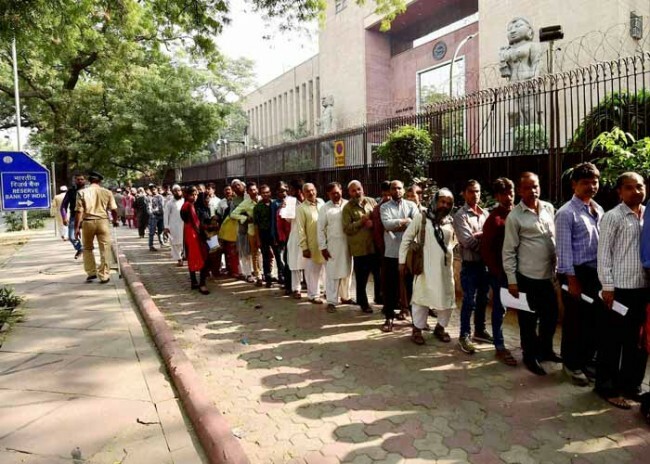 I had two situations to experience the effect of “Note Bandhi”, one on January 25th dealing with State Bank of India and another on February 2nd, dealing with the Reserve Bank of India. The experience with State Bank was more personal and the one with Reserve Bank is common to all Overseas Citizens of India (OCI) or Persons of India Origin (PIO) (by whatever phrase your association with India is known). I will explain both the situations in the following paragraphs in more details. OCI and NoteBandhi: I arrived in India on 24th January, 2017, first time after the “Note Bandhi”. Since cash being the main medium of spending in India, one had to carry bundles of rupees during the stay in India. At the end of every India trip, some rupees within the legal limits of carrying foreign currency will be left with you and the same is retained even after you exit India. This cash comes handy on your next trip, to pay for the immediate needs such as the taxi from the airport to home and miscellaneous expenses until you get a chance to go to your bank and draw money from your NRI account. Most people who make frequent trips to India practice this retention of left over cash. We too had some which was within the limit of the Rs 25,000/- allowed to carry abroad. Most of the notes were either Rs 500 or Rs 1000 in old currency. The RBI (Reserve Bank of India) announced that those holding old currency and are abroad on and after the demonetization on 8th November, can deposit the old currency in select RBI branches until June 30, 2017. Many in the diaspora wrote detailed blogs on this policy but failed to read the fine prints of the announcement. After a 45 minute wait in the queue (a queue of just one person in front of us with 3 custom officers handling the currency exchange certification in Kochi airport), the customs officer in Kochi airport examined the Indian currency with us and issued the prescribed certificate to be presented to the RBI for exchanging it with new currency. Neither while standing in the queue nor while issuing the certificate, did the learned customs officers of Government of India tell me that this rule is not applicable to OCI holders. They did examine our passport, OCI card and whatever travel documents we had. I am not sure the customs officers were ignorant of their own rules or negligent as I was in reading the notification. Armed with the certificate issued by the customs officer at the Kochi Airport, I took a flight to New Delhi from Kochi and reached RBI Office in New Delhi on 2nd February 2017. Contrary to my expectation of a short line as the note exchange was only for people who were abroad when the demonetization notification was issued, I saw thousands of people lined up to exchange the old currency with new ones. My wife and my friends who accompanied me occupied a spot at the tail end of the queue. I walked towards the RBI gate to have a feel of how long this could take for us to get our old currency exchanged on that day with that many people in the queue. Reaching at the gate, I found a few people arguing with the security guards. There were no officers at the gate to respond to the queries of the people in the queue. I watched the situation for a while and googled the phone number of RBI. I was routed to Ms. Saroj Kalia, General Manager (currency). I explained the purpose of my call to Ms. Saroj and apprised her of the situation outside the gate. The decent lady in Ms. Saroj transferred my call to one Mr. Rana, who is the officer-in-charge of currency exchange. I explained to Mr. Rana the purpose of the call. Mr. Rana told me that all that we read from various websites and social media are incorrect and the old currency exchange relaxation until June 2017 is applicable to only for those holding Indian passport who were abroad since November 8th 2016 and were returning to India for the first time. Mr. Rana further said that the notice is pasted outside the RBI gate which I can read for myself. Several people were crowded in front of the place where the notice was pasted. After significant effort, I positioned myself to read the notification and learnt that OCIs are not NRIs (which I should have known anyway) and the rule to exchange the old notes with new ones is not applicable to me and fellow Overseas Citizens of India (OCI). Rule is rule and I take pride in abiding by the rule. Educated well enough with the information pasted at the RBI wall and realizing the 22K rupees loss (I spent for myself and my wife to travel to Delhi by air) in addition to the customs cleared old notes, I attempted to call Mr. Rana again to ask him what I should do with the old currency notes. Since Mr. Rana did not pick up the phone, I thought he is busy and called the GM (currency) again. The GM gave the line again to Mr. Rana. I asked Mr. Rana that now that I know that I can’t exchange the old currency under the prevailing rule, what should I do with the old currency. Mr. Rana bluntly told me that what I hold is not currency but “kagaz-ka-tukada” and I should wait for further notification from the Government on what to do with the old currency. I asked Mr. Rana that since he handles the issue, will he be reporting our concerns to the Finance Ministry to which Mr. Rana said, he only get directions from the Finance Ministry and informing the FM of the issues faced by the public is not part of his role. I pleaded with Mr. Rana to at least send some officers outside and announce what he said to me, so that thousands like me who are not technically NRIs need not stand in line for hours to learn what I learnt from him. I am glad they did come outside and announce to the public and I could see several people branching out of the queue surprised and disappointed about their money which was legally obtained while exchanging foreign currency at some point becoming “kagaz-ka-tukada”. Some OCIs were still standing in line when I left hoping against hope that their old notes would somehow get exchanged. They may have also met with disappointment when they reached the counter of RBI. I followed up with RBI, called Mr. Rana on 5th May, 2017 seeking a direction on what to do with the old currency and the certificate issued by the customs Officer as I have not come across with any new notification from the Finance Ministry. RBI still hasn’t clarified what should I and people like me should do with it. Never in the past have I felt that “I am a complete alien in India” until this incident. This is one of the several examples that all the pronouncements by PM Modi to the diaspora are not trickled down to the policy makers and the bureaucracy or are not being followed by policy directions. Currency withdrawal limit and my predicament: Unlike previous visits to India, this time I had a special purpose, the wedding of my daughter. The marriage was on 29th January, 2017. As usual, I visited the State Bank of India branch in my home village where I maintain my NRE account. My brother who accompanied me forewarned that there could be a lot of people in the queue. When I entered the bank branch, there were approximately 60 to 70 people thronging the bank counters. Spoiled by the bank facilities and customer service that we enjoy in the US, one could be easily disturbed with that sight. Soon I figured that there are several queues, and the lengthy one is for cash withdrawal. One would wish if the Bank could minimum offer a seat to the waiting customers. Probably the term “Customer is God” is not applicable in “Gods own Country”. In the past, usually, I walk into the Manager’s office and do all my banking items and along with the Bank Manager help me get the cash that I need. This time there were no familiar faces as all the staff in the branch appeared new. The branch manager’s office was empty, so I walked to the service manager to enquire about a KYC formality. The service manager recognized me when referred to the email correspondences that we had previously. I gave the KYC proof which the service manager examined and asked me to come back when the branch manager would be back. The branch manager had gone to get cash which I think is brought every day from the main branch in another city. My wife had some locker related work which she did with the help of the service manager. We left the bank to return after 3 hours to withdraw the cash. This time the branch manager was available. We knew that the withdrawal limit is Rs 24,000/- per week and my wife stood in line with the check. We could not use our ATM card as it wasn’t working, possibly due to non-usage. I went into the office of the branch manager. There were two people sitting and a few standing in his office. The branch manager was multitasking with all of them plus answering the staff. The service manager introduced me to the bank manager and I was offered a seat. I was a little hesitant to occupy the seat as several customers standing came earlier than me. The branch manager asked again to be seated and I happily did and thanked for the gesture. I then introduced the need for additional cash for my daughter’s wedding the following Sunday. The branch manager mentioned, that I can only withdraw Re.24,000/- in a week from my account. This is the relaxed ceiling after the Re. 4000/- for a longtime post demonetization. I referred the much-publicized relaxation of drawing up to 3.5 Lakhs for wedding purposes. The branch manager mentioned that such a relaxation does not exist. Even if it existed, is not wise to go that route to get that relaxation as the documentation required for it is cumbersome and unlikely to be sanctioned prior to the wedding date which was 29th January. I enquired whether my wife can draw money from the account as she is a joint account holder with me to which we were told that the limit of Rs 24,000/- per week in cash is per account and not per account holder. By this time, I got the full view of the gap between the policy statements and the implementation reality on the ground. I would however, give my full mark to the bank manager and the bank staff for their patience and perseverance. One must admit and admire that the bank staff have been doing their best with all the odds and constraints. Learning that I can’t get more cash and with just Re.24,000/- in hand, my effort was to save as much in cash for the wedding. I hoped, at least some expenses could be met by check or credit card. I requested the taxi driver who picked us up from the airport to accept check or to wait for a week to get more cash otherwise the cash in hand for my daughter’s wedding would have been just Rs 19,200/-. The taxi driver preferred the wait instead of other modes of payment. I braved to get the wedding going with just Rs24,000/- with me. My sisters and brothers came forward and together collected another Rs 50,000/-. There were hardly any takers for check or credit card. Since my daughter had already decided that the wedding would be a simple ceremony, the need for money, cash or otherwise was minimum. She did not buy gold or any other luxuries. If she did, with lakhs white remittance money of US dollars sitting in my account, I would have been a beggar for cash for an important life event like the wedding of my daughter. I am proud of my daughter for the simplicity she has practiced in her life including in her own wedding. In the end, I appeal to the RBI to give proper direction on what to do with the old notes. I am okay to keep the old notes and the customs issued certificate as a souvenir if there are no legal complications in doing so. I am also one of the numerous OCIs affected by this fiasco of demonetized Indian currency notes. The purpose behind this historic action was said to be taking “black money” out of circulation and should not have been guided by the race, colour, nationality or domicile status of people who posessed the notes. Unfortunately OCIs and foreign national were singled out and discriminated by being exluded from being eligible to exchange their legitimately held money. The deputy high commissioner of UK, Mr Patnaik gave an assurance openly and categorically on Sabras Radio of Birmingham that no one will lose their hard earned and legitimately held money (available on Youtube). It has simply turned out to be lip service. My e-mails to the HCI Mr Patnaik, Reserve Bank of India and Mr Modi himself have not been acknowledged, let alone getting a reply. Where does an OCI go from here? Modi government seems to have forgotten this matter and has moved on, it seems. When India is celebrating 70th anniversary of its independence and is boasting to be on the way of becoming a leading country in the world on all fronts, unfortunately our supreme leaders can still get away with scandalous and dictatorial acts like this. Had the same exact experience as Mohan and about 3 weeks before his (Jan 20, 2017).I was told by the guards at the RBI entrance to read the notice based on my passport (USA). So luckily I didn’t waste much time and didn’t loose additional money for the flights as I was there on a business trip. Agree with the article and other commentators – disappointed by Indian government handling of the note exchange when it comes to OCIs. I felt OCI was a joke when it didn’t entitle a basic amenity like currency exchange that was permitted for NRIs. OCIs -Just remember this before investing your hard earned money in India. If you hold more than 10 notes of Rs 500 or Rs 1000, you become a criminal. That’s the new law that Modi the thug passed soon after the last date of exchanging notes lapsed. So, if I am correct, you do hold more than Rs 10,000 in old cash – therefore, you are now a criminal in the eyes of Indian law / authorities. Since you pride yourself in abiding by the 3rd grade laws of India, I am wondering how you feel that you just became a criminal!